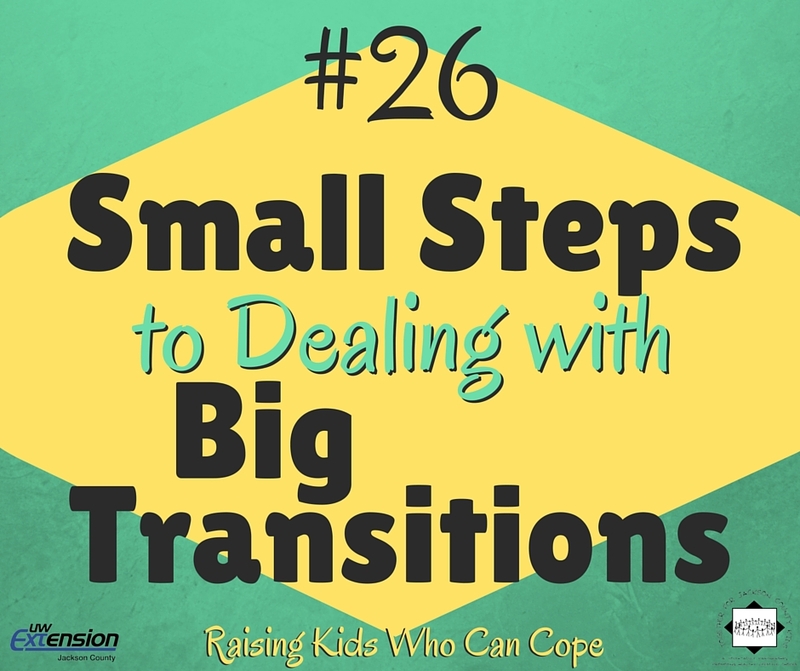 Transition and change can happen almost daily for our kids. Sometimes the change seems so huge or the goal so difficult to reach that young people feel they can’t even think about trying. This may involve a move for the family, a divorce, death, job loss for parent, a military deployment, or the physical, emotional, and social changes that our youth go through in the pre-teen and teen years. The first step is to help youth recognize what the current transition or change is that is taking place in their life. Then together look at the consequences of moving forward by making wise choices versus what might happen if wise choices aren’t made or they would choose to not move forward to make a change. Next provide guidance as the youth contributes by identifying and dividing the difficult transition into small steps with each step moving closer to a solution. To our youth, the process seems more manageable going one step at a time and when accomplished, they feel that sense of being in control and successful. They also learn that mistakes happen; sometimes they could have prevented them but the next time they will be more prepared for them. Include a timeline of when to have the steps completed as a guide for the youth and the adults. To support youth through these times, maintain a strong sense of accessibility and security by spending time together and allowing time to adjust to new situations. Roehlkepartain, Eugene C. www.parentfurther.com, a Search Institute resource for families. This entry was posted in Raising Kids Who Can Cope and tagged change, coping skills, managing stress, youth. Bookmark the permalink.